Get a clear picture of asset performance. Surga Central’s interactive stacking plans give you a complete picture of occupancy information, vacant space and lease expiry data. Engage with commercial tenants, investors and owners in new ways, present tenancy information and analyse upcoming vacancies. 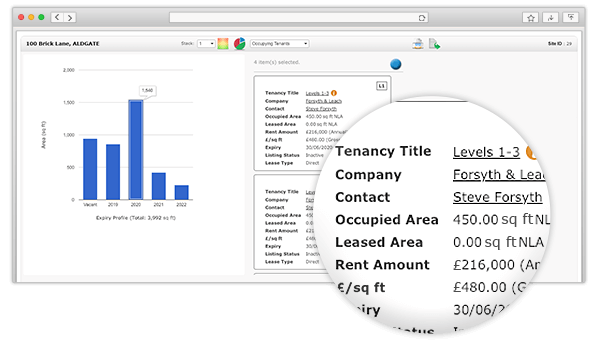 Tenant mix charts provide a visual breakdown of various tenant types at a building or commercial premises. With one simple click, gain a visual perspective of your asset’s tenancy types and analyse risk vs. opportunity. 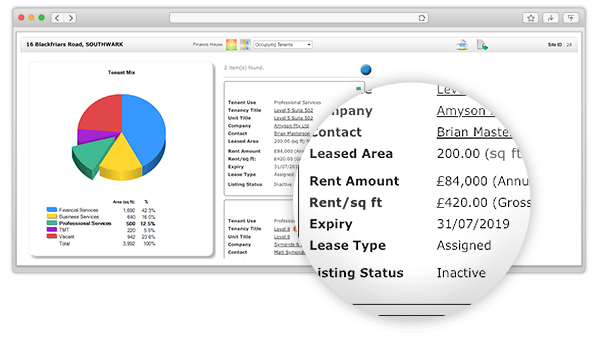 Prepare and send tenant mix reports to your property owner or share with prospective buyers and tenants. Keep a visual tab of asset performance and know ahead of time when tenant leases are due to expire. Take a proactive approach to managing tenant requirements ahead of time and secure leasing opportunities.